Confidential Restonian Operative "Robert" sent us this cellular telephone photograph taken on the outskirts of Reston Town Center, near Bluemont Drive and the Hyatt Parking Garage. Aw, it's nice that they put up a sign to warn passing motorists about pedestrians. But wait, what are those flags? In case you can't read the concise, user-friendly instructions for which RTC is deservedly famous, our favorite stressful, city-like shopping center has come up with a cunning plan to keep their less elite patrons -- the ones who show up on foot or (shudder) bike instead of paying a completely reasonable price to park -- from being run over before getting to enjoy a premium midscale chain retail experience. That's right, silly rabbits, they literally want people to pick up a cheap plastic flag and wave it at speeding cars as they cross the street, then return it to a receptacle if once they make it! This may be the last post ever on this filthy "web log." We couldn't possibly top this. 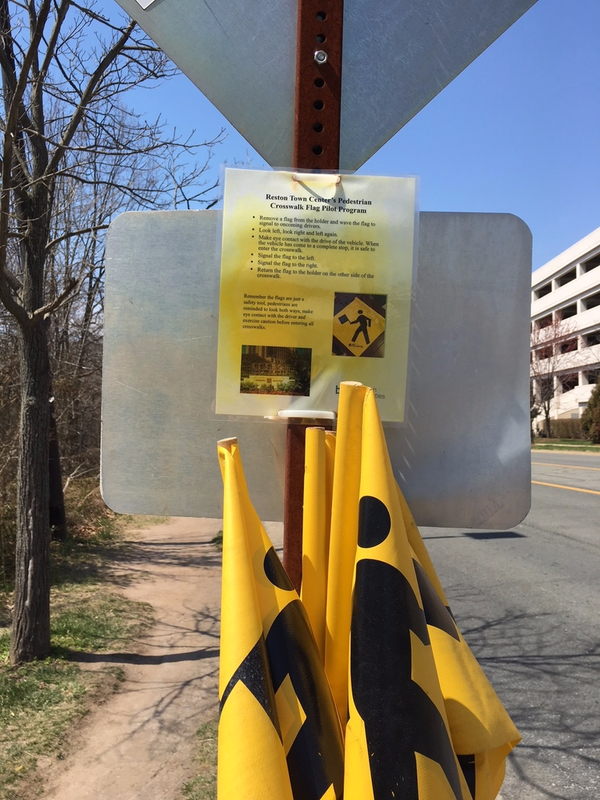 In TOTALLY UNRELATED news, there's no truth to the rumor that Fairfax County is scheduling the first of fourteen public impact hearings about potentially replacing the proposed W&OD trail pedestrian bridge across Wiehle Avenue with a similar bucket-o-flags, although preliminary design studies won't be completed until early 2022. "We can't stop development waiting for a handful of 49 cent plastic flags to be bolted haphazardly onto an existing signpost," a county planning official didn't say, probably, the end. 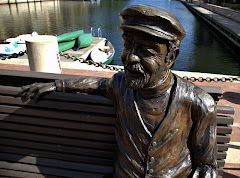 Update: This inspired piece of poetry, from our favorite correspondent, The Peasant From Less Sought After South Reston. 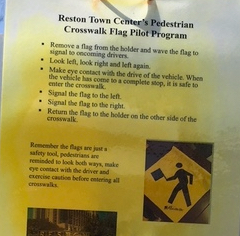 Don't give the county any ideas, Restonian. This has been done in Salt Lake City for over a decade (maybe longer). We can discuss how effective it is, but it did get people to slow down. How can I see anything with all those flags obstructing my view?